Coverage: Follow live coverage across BBC TV, radio, Connected TV, the BBC Sport website and mobile app. England centre Emily Scarratt is a doubt for the start of the Six Nations with a hamstring injury. 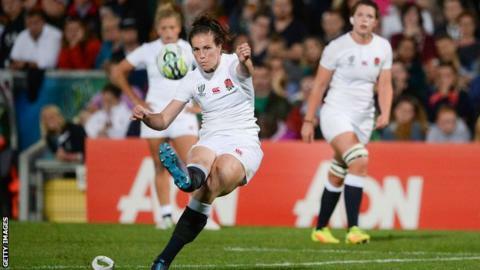 The World Cup winner recently became one of the first fully professional 15-a-side England women players after switching from the Sevens programme. But she faces a race to be fit for England's opener against Ireland in Dublin on 1 February. "It potentially [puts the Six Nations in doubt]" Scarratt told the BBC's Rugby Union Weekly podcast. The 28-year-old suffered the injury at the Dubai Sevens at the end of November, and hasn't played since. "I am aiming to be back in a couple of weeks' time to play in the club game between Loughborough and Worcester [on 26 January]. "If that all goes to plan and I get through that then I will be in with a shout." However having been on the Sevens circuit since the Rugby World Cup in 2017, Scarratt says she may need time to adjust to the 15-a-side game. "Obviously I haven't played a huge amount of rugby in the last year-and-a-half 15s-wise," she added. "My focus is just on trying to get myself back fit and in the mix, and then it is up to the coaches." Hear from Emily Scarratt, Natasha Hunt and one of the stars of the future in the women's game, Hannah Botterman, on the latest edition of the Rugby Union Weekly podcast. Everton v Man Utd - can United move into top four? Read more on Everton v Man Utd - can United move into top four? Alan Shearer's goals record of 260 is one of the Premier League's most enduring, but can any of the division's current top forwards beat it? Manchester City's win over Tottenham did not provide the goal-laden drama of the Champions League epic but it was just as gripping, writes Phil McNulty.